Are you ready for some football your new favorite commercial? Well, Mattel’s new campaign “Dads Who Play Barbie” will warm your heart as the football season wraps up. 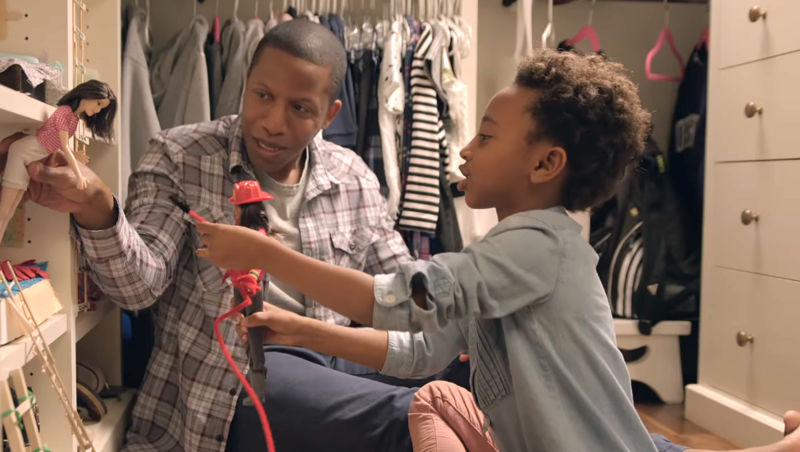 While you wouldn’t automatically think these two things would go together, the toy company’s latest campaign shows how important it is for fathers to play toys with their children. According to CNET, the Dads Who Play Barbie commercial first aired on Sunday, January 22nd during the AFC Championship Game between the New England Patriots and Pittsburgh Steelers. (The Patriots won and will be headed to the Super Bowl). The campaign focuses on men who say they enjoy doing stereotypical “male” things, like watching football, but who also make time for their daughters when it comes to playing with Barbies. "Time spent in her imaginary world is an investment in her real world." Not only should fathers be active in their children’s lives, but the commercial shows how men can play with a stereotypical “girl” toy. The commercials for the campaign also focus on specific careers — like teacher, firefighter, and doctor — to show the positive impact playing with Barbies can have on young girls as they try to figure out what they want to be when they grow up. The iconic Barbie has been promoting a more inclusive image in recent years with the dolls being created in more diverse body types in 2016. Dads Who Play Barbie seems to be a continuation of Mattel’s efforts to create a better image for Barbie. And along with fathers being able to play with Barbies, young boys have also shown up in some marketing for the toys. For example, a boy was featured in the commercial for the fashion-forward Moschino Barbie in 2015. Toys for children shouldn’t be gender specific and Mattel’s new commercial takes that one step further by showing that male adults shouldn’t be embarassed to play Barbie with their children. We hope that the next Dads Who Play Barbie commercial will feature a boy playing with the dolls to really show that gender roles shouldn’t play a part in playtime. We’re crossing our fingers for more gender norm-breaking Barbie commercials for this year’s Super Bowl!